LOS ANGELES (AP) -- Andre Agassi opened his final summer hardcourt tennis season Monday with a 7-6, 6-0 victory over Xavier Malisse in the opening round of the Countrywide Classic. 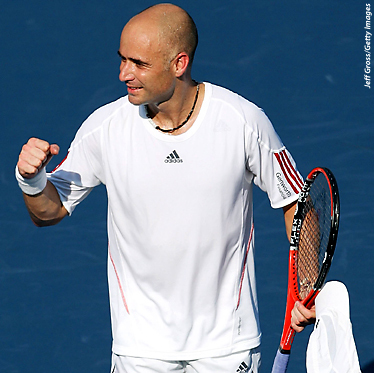 The 36-year-old Agassi has announced that he will retire following this year's U.S. Open. But in beating Malisse in a match played in 110-degree heat, the eight-time Grand Slam champion showed that his appearances between now and the Open won't be merely ceremonial. He trailed Malisse 3-1 in the first set, then rallied to force the tiebreaker and fought off three set points before winning 12-10. The long tiebreaker and its outcome took more of a toll on the 26-year-old Malisse, of Belgium, and he offered only token resistance in the second set. Agassi, the No. 5 seed, is the defending champion of this $500,000 event and has won it four times. Earlier in the day, No. 3 seed Fernando Gonzalez of Chile and No. 8 Dmitry Tursunov of Russia both moved into the second round by winning a pair of tiebreakers. Gonzalez beat Gilles Muller of Luxembourg, 7-6 (5), 7-6 (5) and Tursunov defeated Thailand's Danai Udomchoke, 7-6 (5), 7-6 (4). Muller, a left-hander, lost to Agassi in last year's final.